Tulip Siphon, Table top and Group filters have high quality filter element, the Tulip technology, which is made of diatomaceous earth, treated with nano silver to avoid growth of algae and to avoid recontamination of the filtered water. 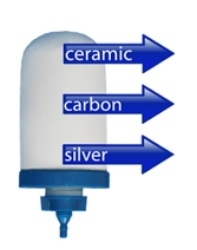 The filter element contains activated carbon to remove color and improve taste. This combination ensures that even turbid and highly contaminated water becomes safe and attractive to drink. There is a removal of E-coli bacteria of >99.99%, protozoa removal of >99,99% and turbidity removal of 99%. This helps to prevents water borne diseases like diarrhea, cholera, giardia, cryptosporidiosis, typhus and schistosomiasis. The silver technology guarantees the safe storage of water. Due to the controlled release of silver particles, bacteria are unable to live and grow in the filtered water, ensuring that the water remains safe for usage for a sustained period. Our candles are produced in the factory in Pondicherry, India. Many of our international agents import the candles and assemble them into water filters within their own countries, saving costs and stimulating local economy.